Between September 24 and 28 2018, the University of Porto will receive an unconventional audit, both by theme and by the auditors who will carry it out. 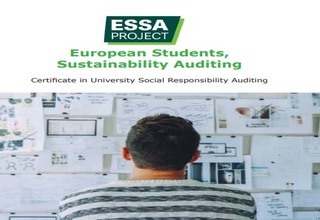 This is an audit in the scope of social responsibility and sustainability, carried out by trained students who are taking part in the ESSA Project. But what is the ESSA Project? The ESSA Project is a European project co-financed by the Erasmus + programme. The objective is to train students in higher education in the area of social responsibility and sustainability, raising the pertinence of the subject to this population. Through a method centered on the student, the project provides students with training that culminates in an audit of the Universities involved: University of Edinburgh, University of Kaunas and, as expected, University of Porto. The audit at the University of Porto is the third audit associated with this project. Through document analysis, interviews and focus groups with several direct and indirect stakeholders in social responsibility and sustainability, the ESSA Project auditors seek to know the vision, policy and practices on these topics at the university. This analysis will culminate in a diagnosis and sharing of development suggestions delivered through a final presentation and report by the student auditors. The Project has been developing since it began in September 2016 and being recognized by those who participated in it as innovative and rewarding, so a week of frantic learning is expected at the University of Porto. To learn more about the Project, explore our website or follow ESSA Facebook.